Commercial building owners in Ohio, Pennsylvania, and West Virginia know that flat or low slope roof systems have certain problems generally associated with them. But the good news is that these problems can easily be resolved with roof coatings. These coatings are engineered to eliminate never-ending leaking, ponding, and rapid deterioration caused by the elements. J&M Roofing LLC uses Conklin roof coatings which have been applied to over 2 billion square feet of roofing throughout the United States since 1977. With the coatings in place, you now have a white roof that reflects the sun’s hot UV rays rather than absorbing them the way black roofs do. Conklin roofing systems & roof coatings have been proven to be energy efficient in some very intense situations. There are a lot of roofs that can be ‘saved’ rather than torn off and redone. This makes coating them more economical. You don’t have to pay for disposal and it certainly beats paying for constant leak repair. Tearing off your old roof is expensive, which is why restoring your roof through Conklin roof coatings is more practical and economical. Application is less disruptive and often consists of only a small crew – often quiet and unseen – prepping and spraying flat roof coatings. Today there are millions of square feet of heavy, black BUR and Mod. Bit. roofs in serious decline due to age and the effects of thermal expansion. By applying one of Conklin’s lightweight, white, reflective coatings directly on top of their existing substrates, building owners can save a substantial amount of time and money. 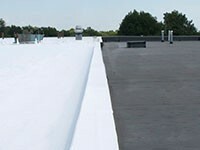 As you can see, Conklin’s roof coatings can be applied to any commercial roofing material. Elastomeric is an elastic coating which goes on as a liquid. 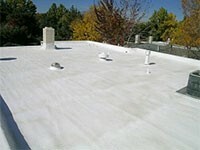 This liquid then dries and becomes a bright, clean and modern coating that prolongs the life of your roof. It will expand and contract and in the summer heat, it will stretch. After dark, the membrane goes back to its original size. Ensuring a trouble-free protection all year round, it won’t crack, leak, or bubble. This is a complete waterproofing system that significantly improves your building’s energy efficiency in Ohio, Pennsylvania, and West Virginia. Each problem area is systematically addressed during the restoration process. The entire roof is then sealed with a reflective finish coat that also cools the roofing surface, cutting cooling costs by 20%. 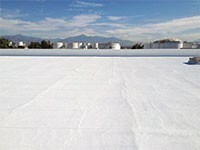 With the high cost of asphalt roofing, roof replacement is expensive compared to some coatings. Roll asphalt generally only lasts 10 years. With Conklin elastomeric roof coatings for low slope roof systems, you can add up to 20 years to that useful life. By using Conklin Energy Star labeled products on a roof, you can lower roof surface temperatures by 15 to 30 percent. The amount of heat transferred into the building’s interior decreases, thus reducing cooling costs and air pollution.